I am thrilled to be linking up with Emily from the Reading Tutor/OG for this recipe linky party. I have QUITE the sweet tooth as you may know. I get this sweet tooth from my mom's side of the family. Most of her 9 brothers and sisters love their sweets and my grandpa used to have a chocolate donut almost every day as well as some kind of dessert after dinner like coffee cake or marshmallow cake. It's amazing he stayed fairly thin his whole life ! I remember going with him to the Entemann's Factory Store so he could get the day old (but not expired) goodies. 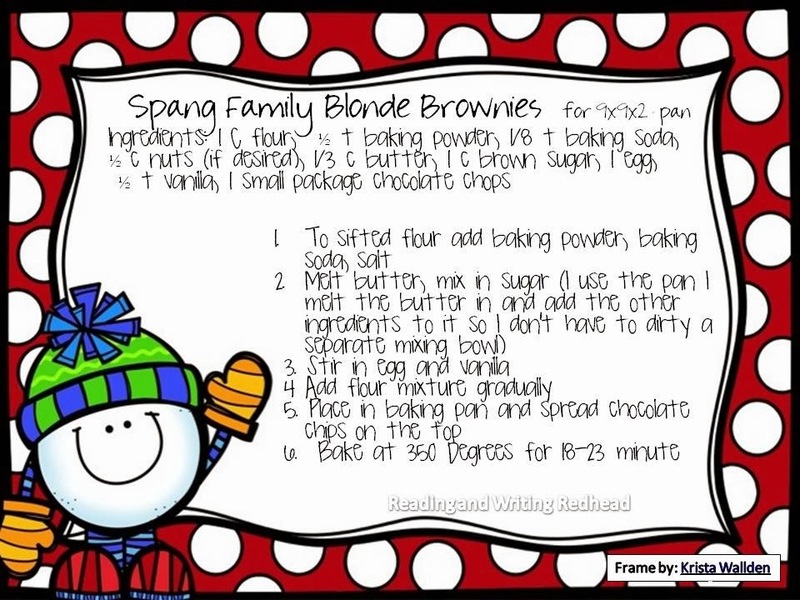 Here is my family's blonde brownie recipe. Now, I know this was not originally ours. I imagine someone else thought this up and someone in my family tried it and love it. But the recipe card I have does say "Spang Family Blonde Brownies" right on top! Enjoy! Here's what they might look like when you are all done ! Those look so yummy! I have always wanted to make some, but I never have tried. I will definitely be saving this recipe! Need a New Year's Book Idea for Your Class?